Please visit www.IncursionAlert.com for information regarding RID system development in the Northwest Mountain Region. Air Traffic Controller? You input will be appreciated. 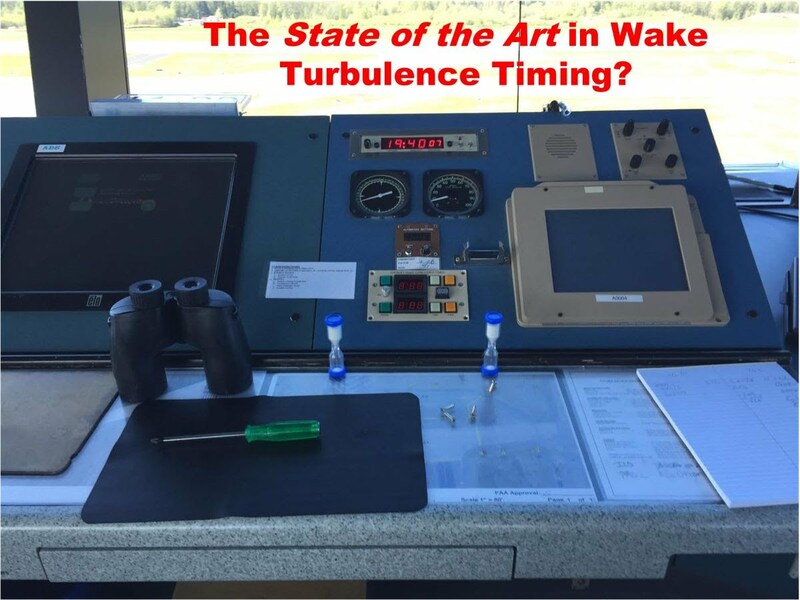 The photo above shows the state-of-the-art in wake turbulence timing prior to April 10th, 2015. A failed AWTT3 in the Paine Field tower is flanked by two egg timers; this tower is somewhat unique across the country in having an electronic timer. Most towers even today depend on egg timers for air traffic safety. On April 10th, 2015, a new era in wake turbulence timing arrived. The first of a new generation of reliable, simple-to-use wake turbulence timers was installed at Paine Field near Everett, Washington. No longer were Air Traffic Controllers dependent on obsolete, outdated and undependable electronic timers or even egg timers. A distinctive audio indication at the completion of a countdown for each timer section. Ease of use was a primary concern during the design of these timers. A single button press initiates the desired countdown. Color-coded displays and buttons differentiate the timer sections. The large LED displays showing the remaining time and the illuminated buttons indicate which time period was selected to provide a glance-able display of timer status at all times. The audio indication at the end of each cycle means the Air Traffic Controller can focus on the critical matters at hand, rather than being distracted by an egg timer, waiting for the last grain of sand to fall. The WTT4 and the WTT5 timers have undergone a year of testing at 10 airports in the Northwest region and have received wide-spread acceptance from the controllers who have used them. Based on the results from the evaluation period, slight modifications in the timer operation have been made based on controller recommendations. These modifications are being rolled out now to the installed timers. The timers have been designed for long term reliability. At the busiest airports, the industrial-grade push button switches, even with a rated two million cycle life span, may reach their service life in 15 years. To ensure reliable operation with little interruption to service, these switches are quickly and easily replaced in the field. Reliability is further ensured by eliminating a common failure point, soldered switch pigtail leads. Nationwide approval is being sought for the WTT4 and WTT5 wake turbulence timers to bring this superior technology to airports across the country. Implementation of the aircraft separation on takeoff for wake turbulence into the NextGen system has been under consideration for some time, but there is no budget to do this. The WTT4 and WTT5 timers are proven, field-tested hardware, ready to go today at a fraction of the cost of modifications to the NextGen System. The WTT4 and WTT5 timers are available at a fraction of the cost of repairing obsolete existing timers. These timers are a preferred solution by many users - always visible at a glance, not hidden under some menu on a computer screen. Making Air Traffic Controllers' job easier isn't the only reason or even the compelling reason to use advanced wake turbulence timers. Why Aren't The Timers Used at More Locations? The WTT4 and WTT5 timers have undergone a year of acceptance trials and have gone through a series of design changes resulting in a proven, reliable, easily manufactured, and cost-effective solution to wake turbulence timing. Currently, acceptance for nationwide use is being sought, but the approval process is tedious.